The KC-767 is derived from the commercial B-767. Does need to replace its four KC-137 (Boeing B-707) air refuelling aircraft and intends to purchase three aircraft. Its tanker has been converted by Bedek in Israel who converted a B-767-200ER. Currently operates B-707 aircraft converted as tanker. Two candidates are considered. The KC-46A currently undergoing test and development and ordered by the USAF and Japanese Air Self Defence Force or a converted B-767. 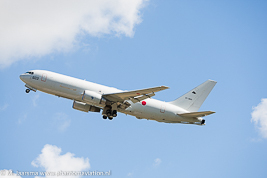 Israel Aerospace Industries (IAI) is converting a B-767 to a tanker aircraft. The tankers are equipped with both the boom and droque and hose refuelling systems. The last is installed under both wings. 14 Stormo (Wing) operates all four aircraft. Its tankers are equipped with a boom refuelling system. To add more refuelling capability it purchases three KC-46A Pegasus tankers. 404 Hikotai operates the four tankers. 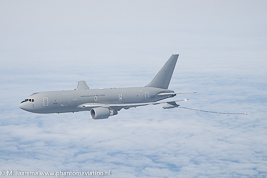 Italian Air Force KC-767A during an European Air Refuelling Training exercise. Japanese Air Self Defence Force KC-767J departing RAF Fairford after participating in the RIAT 2014 static.